I’ve had a couple of weeks off from making my daily pieces for the blanket but over the last four days I’ve caught up on 16 days’ worth of stitching, and finally managed to join all my done squares together at last. 80 days of memories and moods, lovingly stitched into the blanket so far. Officially the biggest thing I’ve made yet. And it’s only about a third complete…. ike!! It’s going to need some serious bordering to help me lug it around without pulling the squares out of shape too much… Eeee. Loving it. I’m using my own square patterns: the puff flower lattice square, and the big gypsy flower square (which I’ve had some lovely ladies help me out with tweaking the pattern writeup the last couple of days!!) and joining them with a flat braid join. Perhaps next year I’ll use a slightly smaller hook so the blanket will be tighter and just that little bit smaller…..!! 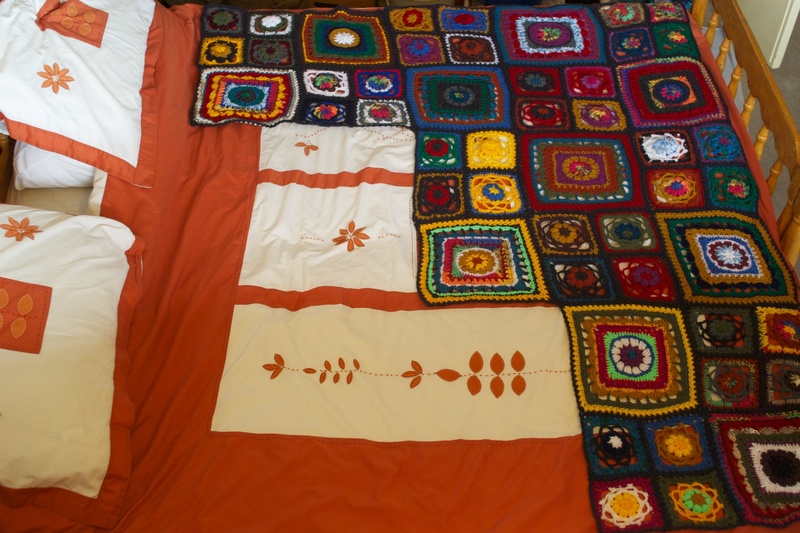 This entry was posted on April 1, 2015 by the messy mama in afghan, blanket, crochet, crochetmoodblanket and tagged afghan, crochet, crochetmoodblanket2015, moodblanket, work in progress.